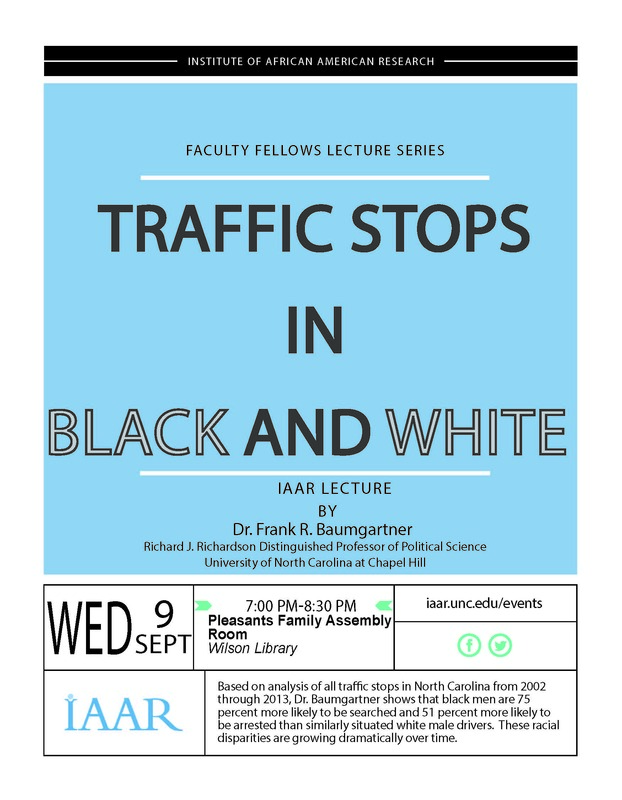 The UNC Chapel Hill Institute of African American Research (IAAR) is sponsoring a lecture by Dr. Frank R. Baumgartner, Richard J. Richardson Distinguished Professor of Political Science at UNC Chapel Hill, on the racial disparity in traffic stops in North Carolina between the years 2002 and 2013. The lecture takes place on Wednesday, September 9, 2015 at 7pm in the Pleasants Family Assembly Room of Wilson Library on the UNC Chapel Hill campus. In collaboration with Professor Baumgartner, the Stone Center Library has prepared a list of resources that have informed this presentation.